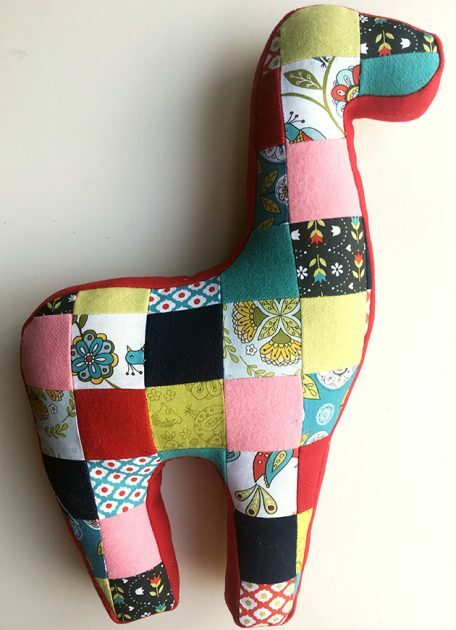 Welcome to Day 3 of the Patchwork Llama Sew-along! 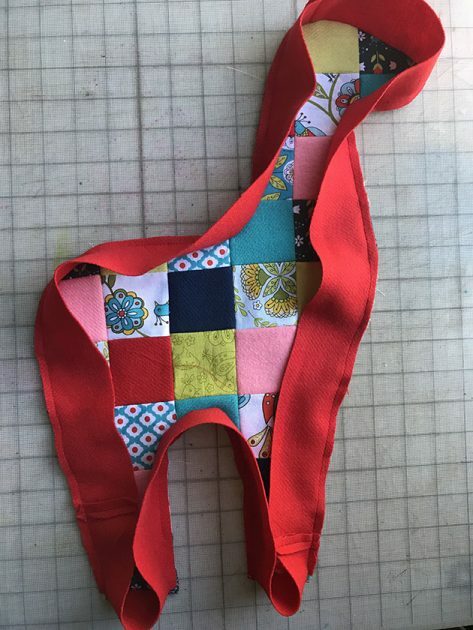 If you’re sewing along with me and you’ve completed Day 2, it’s time to cut your llama shapes out of your sewn patchwork. 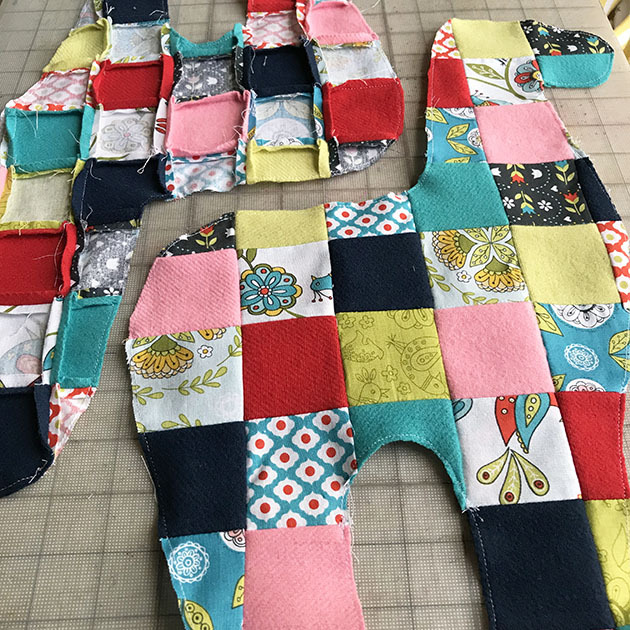 Remember to add a 1/4″ seam allowance to your llama body template and cut a pair of shapes, one in reverse. 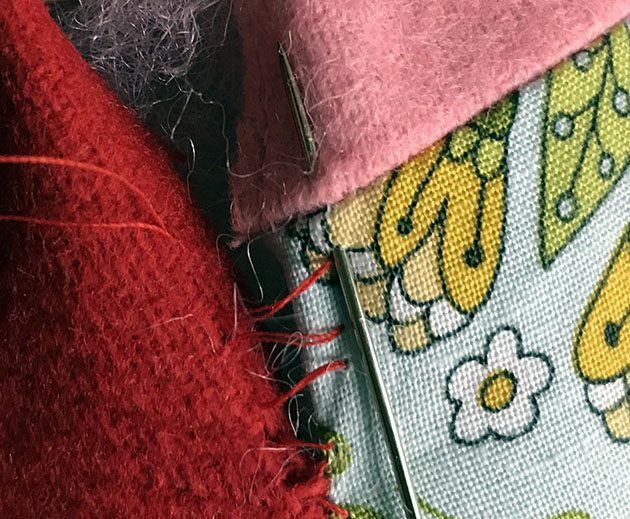 You’ll want to be sure to stay stitch the perimeter of the llama, stitching 1/8″ from the cut edge. This will help keep your patchwork stitching from unraveling. This next part is a little fiddly! 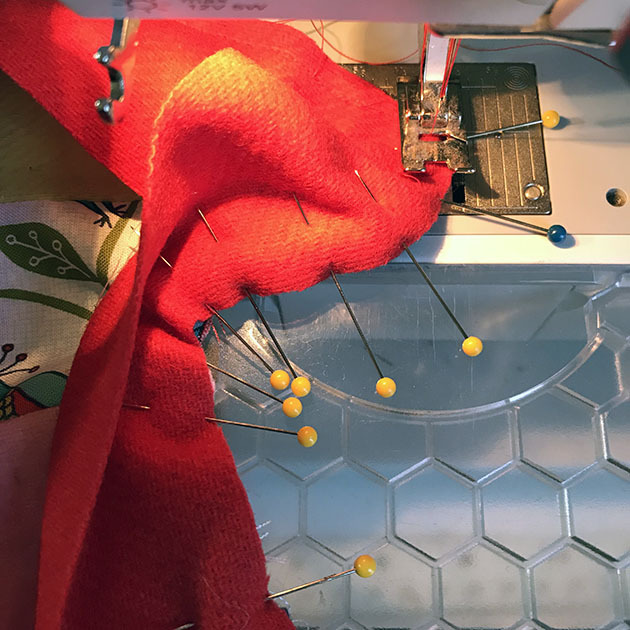 Take your time and be sure to use lots of pins to keep everything in place as you sew. 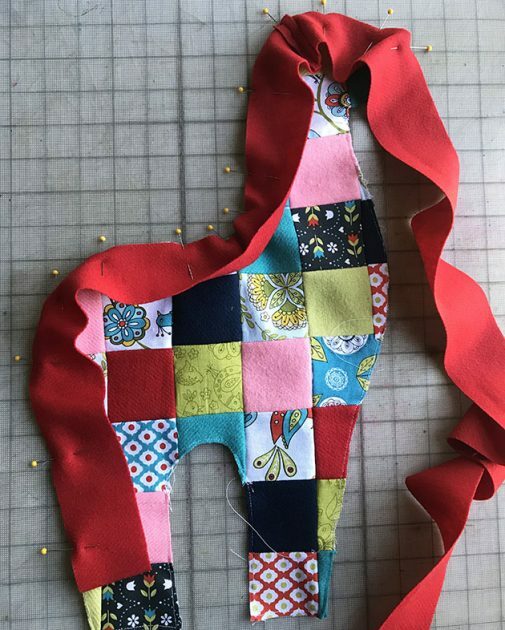 Take your side strip (mine is three 22″pieces sewn end to end with a 1/4″ seam allowance) and pin it along the perimeter of the llama front, right sides together, starting at the back leg up to the nose. 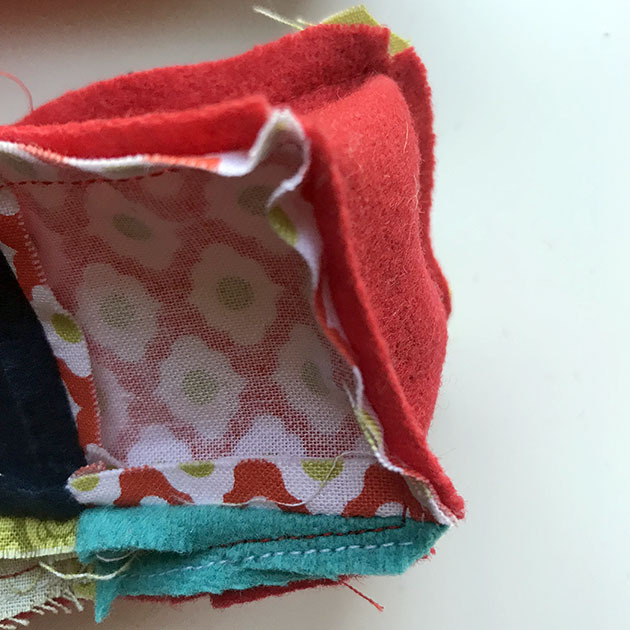 Leaving 1″ free at the start, sew together with 1/4″ seam allowance. 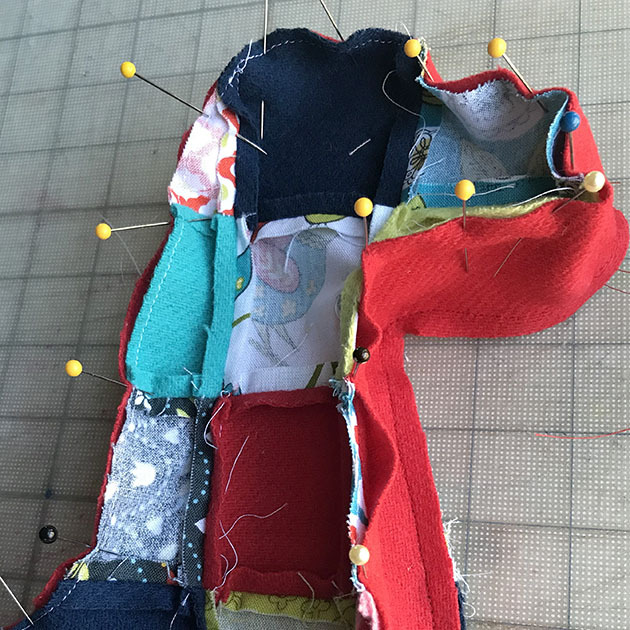 Pin the side strip from the nose to the foot and sew, easing the strip around the curves. I’ve marked the photo to help my stitchline show up. 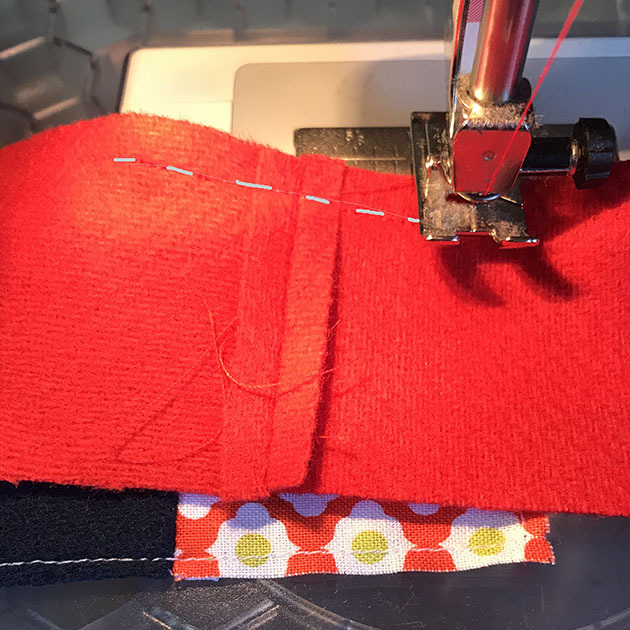 When you get to the first corner of the leg, stop sewing, leaving the needle down. Lift the machine foot and pivot the work. Then match the side strip edge with the end of the llama foot, letting the strip fold to the side. Then sew across the end. At the next corner, pivot again and continue attaching the side strip up the other side of the leg. When you get back to the beginning, trim the excess side strip and sew the ends together. Then finish sewing the last bit to the llama front. Next place the Llama Back on top, right sides together, aligning the edges with the unsewn edge of the side strip. Pin, aligning curves and corners directly across from the Llama Front. Sew around the perimeter, leaving a gap about 5″ long for turning. 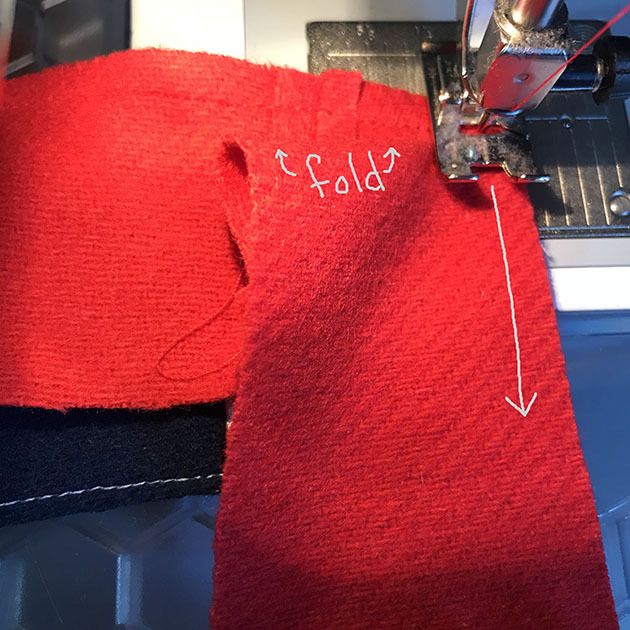 Before you turn the llama right side out, be sure to snip the seam allowances at the corners and notch the curved seam allowances with pinking shears or just snip little notches. This will help your fabric lie smoothly without puckers. Turn the llama right side out through the gap. Stuff the llama with fiberfill, one handful at a time, until it’s firmly filled out. Turn in the seam allowances at the gap and use a ladder stitch to close. There’s directions for the ladder stitch in your pattern or check out my video on Instagram in my Stories.